Catherine Karr, Director of EDGE’s Clinical and Translational Sciences Unit, helps a participant in the Home Air in Agriculture; Pediatric Intervention Study (HAPI) use a device to measure airway inflammation at the Yakima Valley Farm Workers Clinic in Toppenish, WA. Photo credit: Lisa Younglove. A recent profile in The Lancet describes Dr. Catherine Karr, Director of EDGE’s Clinical and Translational Sciences Unit, as “the best of a new breed of physician-scientists that are patient-centered, community-centered, and justice-centered.” The quote comes from Ruth Etzel, Director of the US Environmental Protection Agency’s Office of Children’s Health Protection. Karr’s research focuses on the ways in which a child’s environment affects their long-term health and development and the disparities that characterize those impacts. 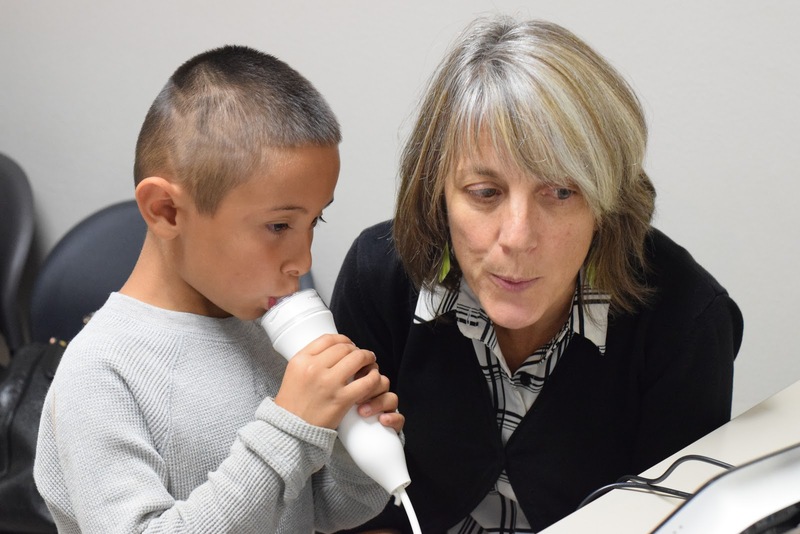 Specifically, she has investigated the role of environmental contaminants in the health of children with asthma in Latino farmworker children living in Washington State’s Yakima Valley. Her work brought attention to the role of crop production, emissions from industrial-scale dairy production, and smoke from winter wood stove use in worsening asthma. Currently, she’s studying whether a combination of asthma education and the use of indoor portable air cleaners can improve children’s health. Karr also leads NEXTGENNS, a project to address wood smoke with the Yakama Nation community and she is involved in the National Institute of Health’s Environmental Influences on Child Health Outcomes (ECHO) consortium. The goal of ECHO is to understand the effects of early life environmental influences, including chemicals and stress, on subsequent child health and development. One of these influences is exposure to lead, a topic of which Karr is an expert, and about which she was recently interviewed by KIRO 7 as part of a story about high levels of lead found in Washington schools. Karr holds a masters degree in toxicology, a medical degree, and a Ph.D. in epidemiology. She is currently a Professor of Pediatrics and Environmental and Occupational Health Sciences at the University of Washington as well as Director of the NW Pediatric Environmental Health Specialty Unit. Read the full profile of Karr in The Lancet here.